Terumi (輝美) was a young human child who was absorbed by the mirror youkai Mitsumo and serves as its current vessel. It's unclear if they come from the Human Village or the Capital City. At some point, they were attacked and subsequently assimilated by the mirror youkai Mitsumo. Despite being used as a tool for transportation and communication by the youkai, Terumi's still just about conscious, but their eyes are lifeless. 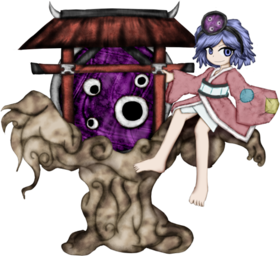 However, its implied that Mitsumo's vessels don't last long, so the youkai plans to discard them soon and find a new vessel. Terumi's condition by the time of Brilliant Pagoda or Haze Castle is already bad, implying that they are on the verge of death (presumably from a combination of exhaustion, dehydration and starvation). However, Mitsumo continues to animate their body in order to talk and move around. According to Shion, they smell like rotten meat, which means that Terumi's body already started to decompose. Their full name is Terumi (輝美), which contains the kanji that means "bright" and "beautiful" respectively. The hiragana was not presented in the demo version of Brilliant Pagoda or Haze Castle to indicate the pronunciation. JynX was asked this on Twitter on 12 June 2015, and thus rectified this in the full version. Terumi has short purple hair and empty purple eyes. They wear a short pink tattered kimono and are barefooted. They wear a small mirror resembling Mitsumo as a hair accesory. Their eyes are lifeless, indicating Mitsumo's control over them. Terumi's body is decaying, so Mitsumo is looking for a new human host. At first, the heroes believe that Mitsumo is a mirror tsukumogami that gained a human form, until they correct them and says that they are actually possessing Terumi. Tsubakura Enraku seems to be genuinely upset by this and attacks them in order to separate them. After Mitsumo is defeated, Terumi is still in their control so the heroes lost interest and fly away but not before Shion eats some of the mirror's lifespan. Mitsumo ambushes Taira no Fumikado and their lackeys, hoping to find a new vessel, because apparently its vessels don't last for long. They plan to discard Terumi and possess Fumikado but fail.